Education is important work for Texas Baptists Hispanic Ministries – for students and for parents. They have a hand in community parenting classes, raising funds for college scholarships for Hispanic students and in GED classes for adults who desire to finish high school. This ministry, led by Director Rolando Rodriguez, helps churches help communities. One such church is Erez Church in Duncanville. On a weekly basis, the church ministers to and disciples over 30 college students who are attending higher learning institutions in the area. 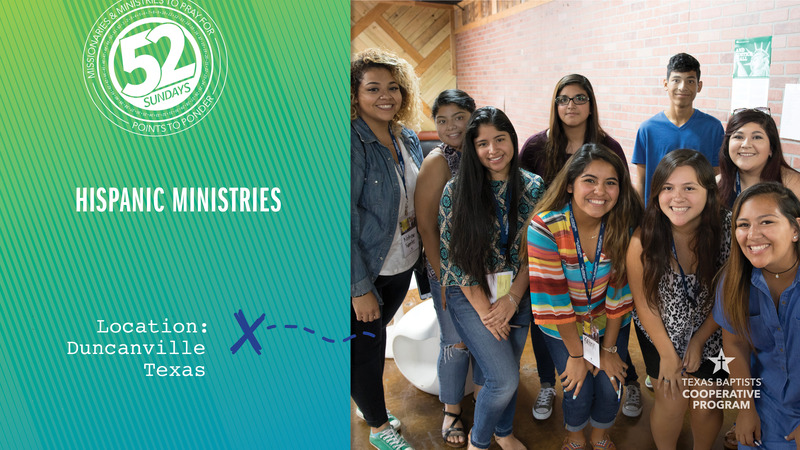 Our church’s gifts through the Cooperative Program help support the Hispanic Ministry Team and their mission to make education a possibility for all generations. Today, let’s pray for the Hispanic Ministry Team as they impact churches and communities through their work. These downloads are available to share during your weekly worship service. Sign up for Cooperative Program stories in your inbox every month. Call us at 888-244-9400 to subscribe to this email list. © 2002-19 Texas Baptists. All rights reserved. Made possible through the Texas Baptists Cooperative Program.